MV cable systems have been using pre-fabricated dry type terminations, joints and splices for years. These include heat shrink, cold shrink and push-on connection types. The use of these types of connections has been a great step forward in simplifying field installations and reducing installation errors in MV cable systems. For HV cable systems the majority of cable termination systems have relied on oil-filled terminators. These terminators require a high level of expertise to install and can fail catastrophically. To simplify the field installation process and increase the reliability of HV terminations some suppliers are now offering dry type designs. One such termination design is the RHM International RIF® cable terminator that uses a resin impregnated fibreglass capacitive graded insulation design. What makes the RHM International RIF® cable terminator unique from other dry type terminators is the uniform electric field control provided by the capacitive graded insulation. 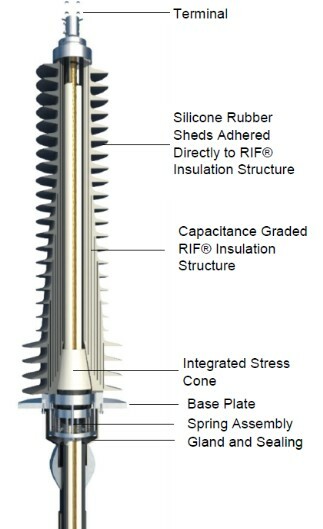 This simplifies the stress cone design for the higher voltages thereby offering a more cost-effective terminator design. The insulation design is based on RHM International’s proven high voltage capacitance graded RIF® bushing technology which to date has over 20,000+ units installed and in-service worldwide. The RIF® insulation makes a very rigid structure so the terminator can be installed as a free-standing device in the substation. Cable stripping and preparation is done in accordance with standard industry practices and the cable termination inside the terminator uses a simple crimping connection rather than relying on highly engineered plug-in type contacts that need to maintain proper alignment and contact pressure over the terminator’s lifetime. The design has been fully type tested with designs currently available up to 110 kV. Future designs will be available up to 230 kV. In summary, this product keeps with the RHM International philosophy of providing safe, environmentally-friendly, maintenance-free and long-lasting products for the power industry. ©2016 RHM International, LLC. All Rights Reserved.